Introducing: Biscuithead and the Biscuit Badgers. Q&A interview with a riotously odd musical outfit from Leeds: "I am available to hide in attics"
WHAT DO YOU DO/PLAY: The band plays ukulele, piano, drums and tuba. I play uke and sing. GIVE US 3 REASONS WHY WE SHOULD TRACK DOWN, LISTEN AND DISCOVER YOUR MUSIC? 1. We will make you smile with your whole mouth you cheeky little hamsters. 2. It will help to keep us off hard cheese. 3. Each one of us will be very grateful and will reserve a small place in their heart just for you. WHERE DO YOU SOUND BEST – FESTIVAL, CLUB, BEDROOM – OR SOMEWHERE ELSE? I always enjoy the intimate gigs. It’s great to feel like I’ve looked every member of the audience in the eye if I can, unless there are only three of them then it’s not as good. We sound best wherever you can hear us. RECORD? ‘Walk like an Egyptian’ by The Bangles. It still has my favourite use of a gong in any record. CD? ‘Mis-shapes’ by Pulp. That song still means a lot to me. DOWNLOAD? I have never downloaded a song! SO, WHEN IT ALL GOES RIGHT AND YOU’VE GOT A MANSION AND A SUPERMODEL GIRL/BOYFRIEND, WHAT WILL BE YOUR BIGGEST MUSICAL INDULGENCE? I’d want to learn every instrument that I’ve loved but not had the time for: sitar, piano, bazooki, banjo, harp (as well a swimming pool shaped like a semi quaver of course and a horse that can fart the national anthem). SO, WHEN IT ALL GOES WRONG AND YOU’VE ACRIMONIOUSLY BROKEN UP CITING HUGE MUSICAL DIFFERENCES, WHAT DO YOU FALL BACK ON? I am a keen gardener and epiphytic cactus grower so maybe I could go out into the fields? Alternatively I am available to hide in attics and make disconcerting noises. Bob really likes ‘Hotel California’ but I think it’s one of the worst songs ever. Matt loves eighties Fleetwood Mac but I would swim the channel to avoid it. Sam loves the sweet keening voice of the recorder but I can’t bear to hear it for a second. In short I am the cause of all divisions within the band. WHO ARE YORKSHIRE’S FINEST IN CULTURE, SPORT AND MUSIC? Cloth Cat are a great local charity who provide affordable music courses in Leeds. They are the best. There are loads of great bands like: Executive Legs, Pifco, Devils Jukebox, the Seven Inches and Ukulele Bitchslap. Also see mind reader Harrison Richards who is a Leeds barefoot legend. NAME YOUR SUPERGROUP – WHO’S PLAYING WHAT AND WHO’S ON VOCALS? Ringo on drums. David Bowie on vocals. Sammy Davis Junior on vocals and spoons. Viv Stanshall on Trumpet, vocals and triangle. Joey Santiago, lead guitar. Paul Simon on bass guitar. Russ Conway on keys. Don Van Vliet, animal noises. Herb Alpert, second trumpet. Frank Zappa, complaining. GO SEE THIS FILM: The American Astronaut. GO READ THIS BOOK: Dancers at the End of Time by Micheal Moorcock. GREAT LOST BAND/ARTIST: The Penny Peeps. WOULDN’T BE CAUGHT DEAD SUPPORTING: The Tories. LONDON, L.A OR LEEDS? Leeds. AND FINALLY … AS YOU LEAVE THE STAGE, WHAT ARE YOUR PARTING WORDS. 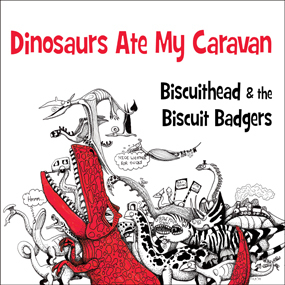 We’ve been Biscuithead and the Biscuit Badgers… We love you all… Good night!